This site has been in my thoughts a lot the last few weeks, but has unfortunately had little progress. I'm kind of torn between trying to use one of these cutesy template website builders to make cool little navigation tabs and graphics, versus just getting the material going. Right now, I'm pretty much decided to do bonehead html and worry about the cutesy later if I have opportunity. I've added a table to allow selection of the school years I have in my archive (I'm open to hosting others). Also, I've been trying to figure out google analytics. I've never had a "hosted" site like this before. I did a very early website for my employer back in 1995/1997 but I always had 'root' access on the unix box I was running the thing on, so I could tinker away with the configurations to my heart's content. Doing it "hosted" is a little awkward, but I'm starting to get the hang of it. I'm going to try to open up the 'content' a little at a time, so that I can watch the effects, whatever they may be, and try to make some early corrections in how I do this before I get too much work invested. I've instrumented the home page with google analytics at least, and I'm going to experiment with the google ads (hopefully to make this site self-supporting eventually) Unfortunately I have to do this stuff in little snatches, so it's going slowly. The main page is in the google cache at this point, but not this blog. I'm setting up this site because I wanted to make available my files of Cubberley Catamounts (the student newspaper) from the years (1966-1969) that I was there. I have scanned the ones I have, and most of the files are PDFs, which makes them more-or-less searchable, although the OCR software isn't smart enough to always figure out multiple-columns. Single-word searches work pretty well, but phrases may be more difficult. I also own a LOT of photographs I took that were never used in publications. I was a staff photographer for the Catamount, the student newspaper, and the Totem, the yearbook. Some of these old photos are quite good. Some are fun, whimsical, or just interesting. We probably took 10 photos for every one that was actually used, so there's quite a bit of material. I haven't decided yet how to use or present these, but they are also a possibility for this site, or perhaps one of the photograph upload sites (flickr, yahoo! or whatever). I wasn't going to put a blog or anything like that, but Hal Sampson (I'm still in touch with him and several other alums) suggested I put a blog, forum, or wiki so people could give feedback about the site, what's on their minds, and things I might do to improve it. So... we'll start with this blog, and evolve to more complex stuff if warranted by demand. Hopefully, for a start, this blog will capture any thoughts people might have. Since I'm allowed to ramble on a blog (and the older I get the more I ramble), I'll say that going through the photos has been a lot of fun. I've found photos that I completely forgot about, such as a few of the "Fritz Raybine Memorial Band" from the 1967 Christmas Dance, which includes a nice shot of a very young "Stevie Nicks". (There is a cropped version of my photo on page 66 of the 1967/68 Totem ). I sent a copy of the photo to her publicity agent, and he verified it was, in fact, her. 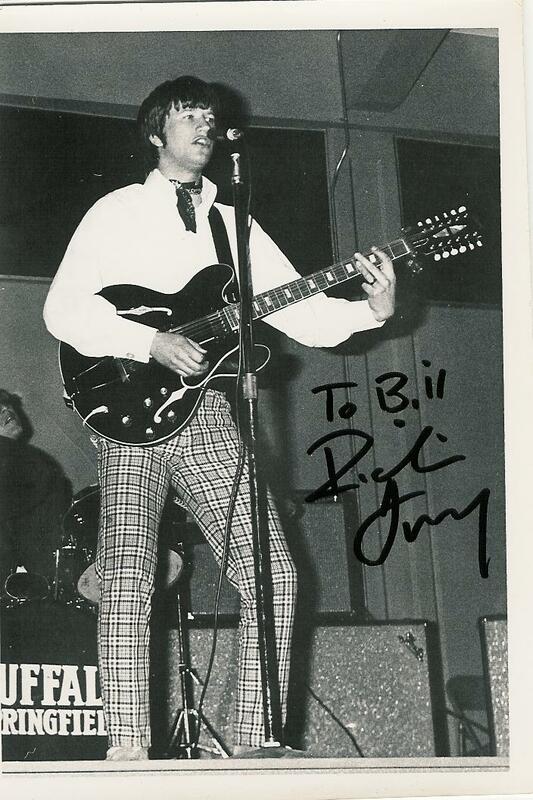 I also recently got a photo I took of "Buffalo Springfield" autographed by Richey Furay when he appeared at our local church, Calvary Chapel, Auburn . Two motion pictures have dealt with events at Cubberley. - " Wait Til Your Mother Gets Home ". Remember Coach Bob Peters? The story is about him and his family. Paul Michael Glaser plays Bob Peters, Dee Wallace plays Pat Peters, and David Doyle plays principal Herman Ohme (so this must have happened after I graudated, since Ohme took over in 1969). - " The Wave " deals with Ron Jones' "Third Wave" experiment in 1967. All the names are changed, and the story has, shall we say, "grown in the telling", but it's easy to recognize the story from the film. IMDB makes references to Jones' publications as well. -"Hassling", by English teacher Sylvia Berry Williams, for example, deals with many of the events that overlap my years at Cubberley. -Ron Jones has written articles, and a book was written by Todd Strasser about the "Third Wave" as well. 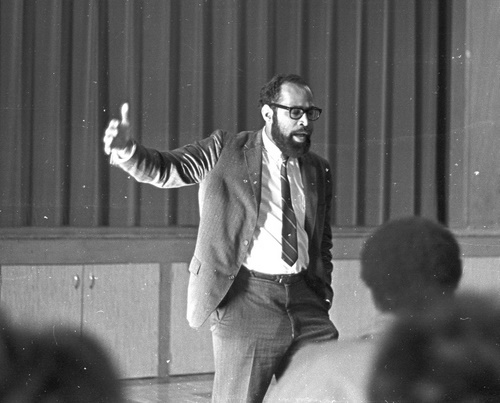 -Scott Thompson wrote an article about campus activism for the "Theory Into Practice" Journal. (Theory into Practice, Vol. 8, No. 4, What Do All Those People Want? (Oct., 1969), pp. 279-283). I'm sure there's lots of other stuff I'm missing here as well. Suffice it to say, these were interesting years, and the history is worth preserving. I'll have to work on "building" more structure (like to access the pdf's themselves, and maybe scan a few pages from the yearbooks), but at least it's getting started.